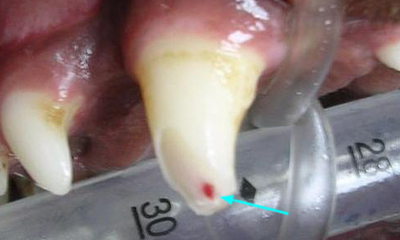 A fractured tooth can be extremely painful for your pet! 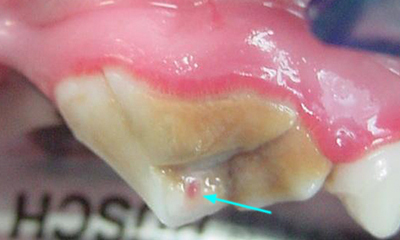 Bacteria will enter exposed pulp, and lead to infection of the tooth and eventually spread to the bone. It can be painful for your pet with possible symptoms; facial swelling, bone infection, draining tracts, nasal discharge, or weakening of the jaw bone. An infected tooth can lead to disease of the kidneys, liver or heart. 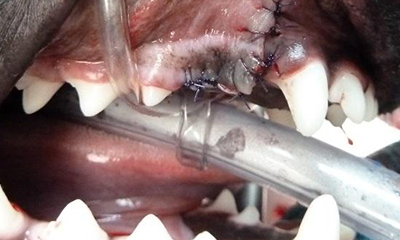 Root canal therapy to retain chewing tooth. Titanium crown to protect the tooth. 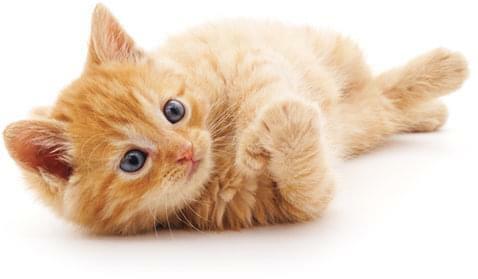 Schedule an appointment today to have your pet evaluated for tooth fractures. 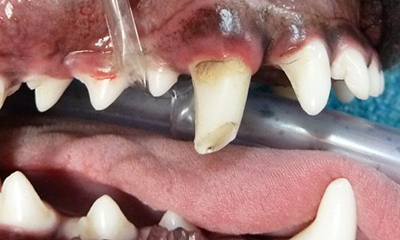 Studies show that 21% of dogs have fractured teeth but few will show signs of oral pain. When a tooth fracture involves the pulp (red or black spot on the tooth) bacteria enter the pulp and over weeks to months an infection occurs. When this infection spreads to the bone it becomes very painful (although few dogs exhibit symptoms pet-owners will notice). The local effects include: facial swelling, bone infection, draining tracts, nasal discharge, or weakening of the jaw bone. Systemic effects include kidney disease, liver disease, and heart disease. 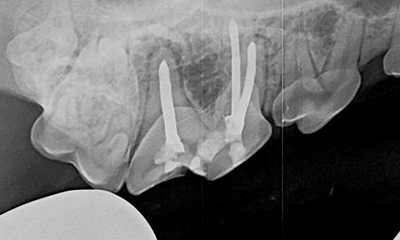 Fracture teeth with pulp exposure need one of two treatments: root canal therapy or extraction therapy. Root canal therapy cleans and seals the tooth so it can be retained for function (chewing, grasping and retrieving), while extraction therapy is a major oral surgical procedure to remove the tooth before an infection involves the bone. 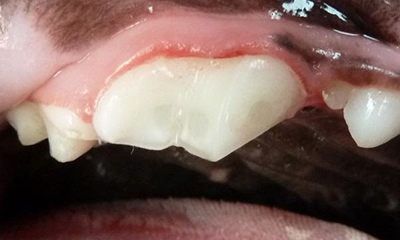 There is no reason to ever take a wait and see approach to tooth fractures. 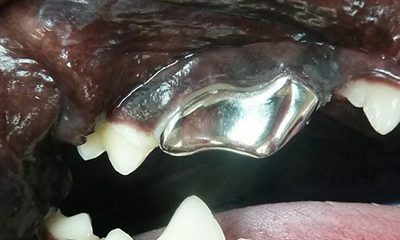 Many clients who felt confident that their pet was not bothered by a broken tooth relate that their pet acted “years younger” shortly after they received treatment. Prevent tooth fractures by only providing chewing objects that “you can dent with your fingernail”. Avoid bones, nylon bones, antlers, and rocks.